Liberals are despicably exploiting the tragic Tucson Arizona shooting as an opportunity to launch yet another "Hush Rush" initiative. A liberal pundit lamented that there is no left wing radio talk show host as powerful as Rush Limbaugh. Typical of their thinking, this lib believes it is unfair for Limbaugh to be King of the Radio Talk Show mountain. In every area of American life, this lib believes government should take control to produce equal "fair" outcomes. So why isn't there a left wing equivalent to Limbaugh? Lord knows they have tried. The left even launched an entire radio network, Air America, committed to trashing conservatives and America. Air America featured several "Great Left Hope" talk show host contenders to dethrone Limbaugh. They all crashed and burned including their radio network. Air America is off the air. Ironically, Air America failed because they committed the crimes of which they accused conservatives. They spewed hate and negativity 24/7. Why is Limbaugh so extremely beloved by millions? One word, character. Rush's listeners trust him. They know Rush would never lie to them. If Rush decides to address a topic, they can always count on Rush telling them the truth as he sees it. 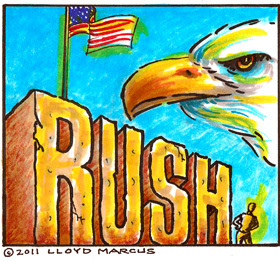 Rush listeners feel his love for America and people. Out of his desire to see all Americans prosper and succeed, Rush spreads the gospel of Conservatism which is the best path for all Americans to achieve their American Dream. Rush is inspirational. Typically, upbeat, optimistic and positive, in times of crisis over the years, millions could hardly wait for Rush's program to hear his words of hope and encouragement. Also, Rush is a great entertainer and a brilliant thinker who is unapologetic and confident in his beliefs. For these reasons, there is a unique bond between Rush and his listeners, a phenomenon the left will never understand. This is why their numerous attempts to destroy and discredit Rush over the years have been unsuccessful. Remember when it came out that Rush was addicted to prescription drugs? The left was elated. In their lack of understanding of conservatives, the left assumed the discovery was the death of Limbaugh; surely his narrow minded self righteous fans would never forgive him. The bad news proved to be a gift from God. Rush displayed great character by "fessing up," explaining the situation and going into rehab. In the end, Rush emerged free of his addiction with a better understanding of himself and a stronger bond with his listeners. "Curses, foiled again!" When all else fails to impugn their targeted victim, the left plays the ever effective race card. Want to shut up a white person? Call him or her a racist. Without one stitch of evidence, over the years, the left has attempted to brand Rush as a racist. I am a black conservative 20 year listener of the Rush Limbaugh program. Never have I heard Rush utter one racist remark. Quite the opposite. I have received life changing inspiration listening to Rush. Rush Limbaugh has become bigger than Rush Limbaugh. This remarkable man inspired the birth of many, many conservative radio talk shows educating a generation to the virtues of Conservatism. The Limbaugh lead conservative ascendancy birthed the Tea Party Movement. To all of you folks of the left who believe you can silence Rush, in the words of my New York/New Jersey patriot brothers and sisters, "Forget about it." There is a powerful new sheriff in town called the Tea Party Movement. The liberal media and the left no longer have all of the power. Rush and his conservative counterparts will not be silenced. We the People simply will not tolerate it.